Kentucky-born Christopher Shy is a writer. A self-taught artist, he has collaborated and written several graphic novels, including his Silent Leaves series. His first published work was under a pen name Ronin, at age of sixteen, after which he began exploring the fusion of canvas and digital art – emerging as a leading figure of this new medium among groundbreaking digital artists, and his large, stunning tempura paintings were exhibited in several cities and major venues around the world, including Echo Gallery in Chicago for over a year. In 1996 he formed Studio Ronin and published collections of his work: The Art of Studio Ronin and Ronin. 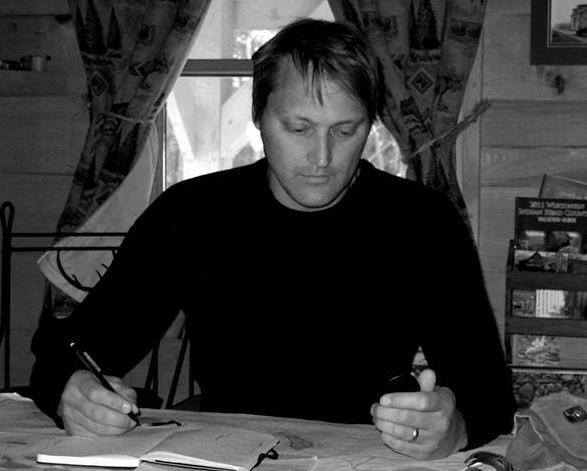 Under his direction and management, Studio Ronin developed a unique and distinctive identity and style in comics, design, concept work, and fine art, weaving seamlessly between and often combining several mediums. Using blends of old-school effects, models and miniatures alongside large-scale painting and artwork, Studio Ronin established itself as a formidable set designer for entertainment and film projects, including Friday the 13th andPathfinder. Shy also designed Coheed and Cambria’s album cover for Good Apollo: I’m Burning Star IV, and also collaborated on their live concert stage design, complete with a giant guillotine. Shy later went on to co-found Ronin Arts and Artemis Publishing, as well as Blackwatch Comics with Michael Easton, with whom he also collaborated on the critically-acclaimed Soul Stealer trilogy. He has worked with DC Comics, Dark Horse, and Marvel comics and just released Silent Leaves; Man to Leaves, the second installment to his bestselling series. His latest book is I Sleep in Stone.